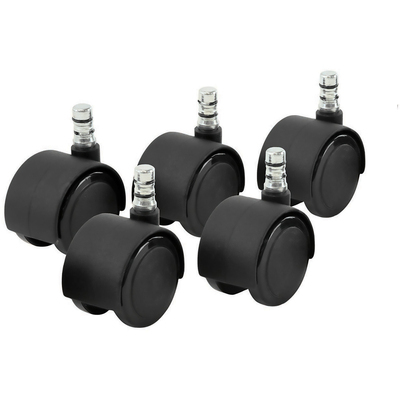 Deluxe Duet Noiseless Casters Are Perfect For When It Is Absolutely, Positively Needs To Be Quiet. Dual-Grip Ring Technology Eliminates Excessive Noise, Providing Quiet Mobility. Duet Twin-Wheel Casters Complement All Types Of Office And Home-Office Furniture. The 2" Diameter, Dual, Hooded Wheels Provide Maximum Mobility And Smooth Quiet Rolling On Light-To-Medium Duty Applications. Hard Wheel Casters Are Designed For Safe Rolling On Carpeted Surfaces, Preventing Stress And Strain To Leg And Back Muscles. Stem Fastener Measures 7/16" Diameter X 7/8" Long. Each Wheel Is Rated At 110 Lb..
Deluxe Duet Noiseless Casters Are Perfect For When It Is Absolutely, Positively Needs To Be Quiet. Dual-Grip Ring Technology Eliminates Excessive Noise, Providing Quiet Mobility. Duet Twin-Wheel Casters Complement All Types Of Office And Home-Office Furniture. The 2" Diameter, Dual, Hooded Wheels Provide Maximum Mobility And Smooth Quiet Rolling On Light-To-Medium Duty Applications. Hard Wheel Casters Are Designed For Safe Rolling On Carpeted Surfaces, Preventing Stress And Strain To Leg And Back Muscles. Stem Fastener Measures 7/16" Diameter X 7/8" Long. Each Wheel Is Rated At 110 Lb.